Fasting will be the longest in Greenland and Sweden, and shortest in Chile and Australia. During Ramadan, Muslims around the world fast for a full lunar month - they begin fasting at the Fajr call to prayer just before sunrise and break their fast at sundown. In recent years, Ramadan has moved increasingly into the summer months which bring long days in the northern hemisphere and sweltering heat for many countries. Conversely, Ramadan has fallen on the shortest, winter days in the southern hemisphere. 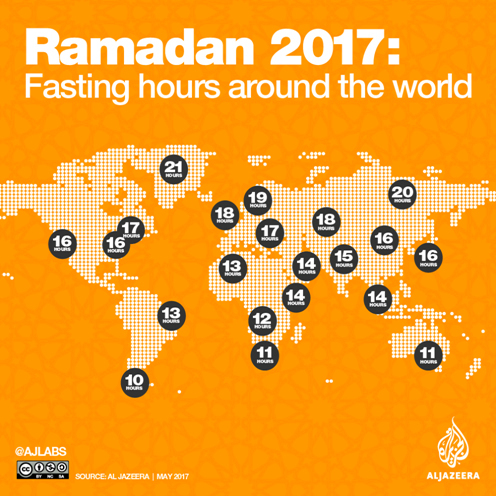 Al Jazeera takes a look at how many hours Muslims, for whom fasting during Ramadan is one of the five pillars of Islam, will be fasting every day. Because the sun rises and sets a little earlier (or a little later) each day, fasting hours in Ramadan also change by a few minutes throughout the month. By the end of Ramadan, the day will be a little longer than at the beginning in some countries, and shorter in others. Below is how long fasting hours are estimated to be in cities around the world. 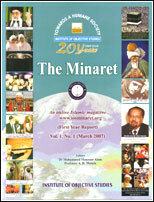 Actual fasting hours and times will vary by day, as well as calculation methods.